With the blessings of His Eminence Archbishop Demetrios of America, the Order of Saint Andrew was pleased to have Father Maximos–a monk from Mount Athos, Greece–as its featured speaker for the 10th Annual Archon Lenten Retreat, April 19-20, 2013. 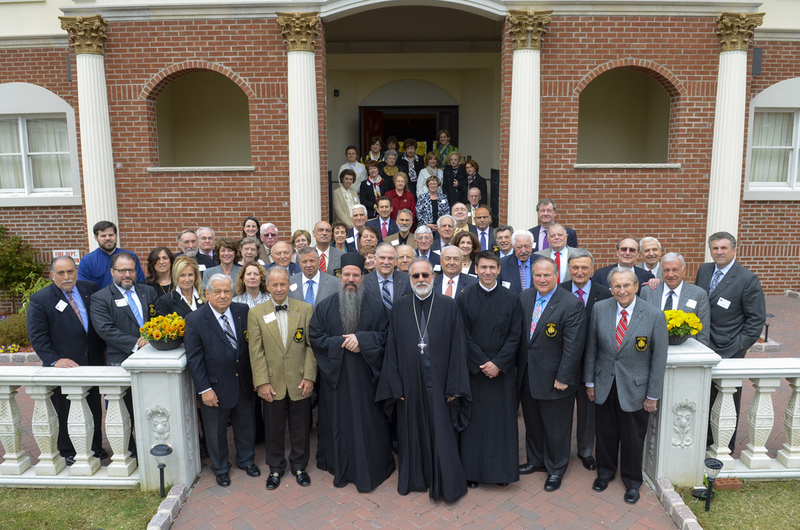 The retreat was held at the Metropolis of New Jersey Headquarters in Westfield, at the gracious invitation of His Eminence Metropolitan Evangelos of New Jersey, and was attended by some sixty Archons, spouses and participants. The retreat allowed everyone to grow in their spirituality, join together in fellowship and prayer, and allowed Archons to reenergize their commitment in the pursuit of religious freedom for the Mother Church of Constantinople. The two-day retreat with Father Maximos commenced on the topic, “The Distracted Life,” following the Akathist Hymn service at Holy Trinity Greek Orthodox Church, Friday evening. The presentation focused on how our daily lives are preoccupied with modern technology such as cell phone devices, tablets, personal computers–all of which permit your mind to wander to something not relevant at the moment. He elaborated on how these distracted thoughts steal our possibility to know God. We consume the ads that we are fed through the media and focus our lives on that which is of the moment and will not enrich the core of our being. We must focus not from surface, but instead to depth; from mind to heart; from outward to inward. The following day, participants celebrated the Divine Liturgy in the Metropolis Chapel. Father Maximos continued with the topic, ‘The Buried Seed,’ stating, “Don’t be conformed to the form of the world; but be transformed by the renewal of your mind.” He mentioned that we receive the gift of the Holy Spirit that God gives through Holy Baptism. It is given in the form of a tiny spark or in the form of a seed–waiting for us to cultivate. Father Maximos stated that the heart is the center of our being, the seed is to be cultivated to bear fruit and the core of human life is the heart which begins at birth. Father Maximos concluded the day offering participants a glimpse into the daily responsibilities of monastic life and how to coexist in a community of people of all backgrounds and past professions, during his afternoon topic, “From Harvard to Mount Athos.” He spoke about the many forms of monastic life: large community monasteries vs. skeets–small homes on hillsides with one central church from which life is lived. He spoke about how Mount Athos is not a place where one is alone. It is communal living with all the responsibilities that go with it. Archon Peter Skeadas, Committee Chairman on Spirituality, was the retreat’s organizer while Archons John Halecky, Jr. and James C. Fountas assisted in coordinating the event with the Metropolis Headquarters. In expressing thanks to Father Maximos, National Commander Anthony J. Limberakis, M.D. said, “The retreat participants are truly blessed to have had the opportunity to participate in a retreat led by such a learned, spiritual and pious cleric. He challenged the retreatants to abandon the distracted life of the superficial and mundane and focus on nurturing the seed of the Holy Spirit that Orthodox Christians receive at baptism by doing good works. Due to responsibilities on the Synod of the Ecumenical Patriarchate, Metropolitan Evangelos was unable to attend this year’s retreat. However, he joined participants via a Skype session that afternoon from the Ecumenical Patriarchate and offered his blessings and greetings. Father Maximos is a native New Yorker, and a graduate of Hellenic College and Holy Cross Greek Orthodox School of Theology. He holds a Ph.D. in patristics, has twice been a fellow at Dumbarton Oaks, and for many years was a professor at Harvard Divinity School and subsequently at Holy Cross. The author of many scholarly books, articles, and translations, his edition and translation of St. Maximos the Confessor’s Ambigua will be published later this year by Harvard University Press. He is currently a visiting professor at Hellenic College and Holy Cross and appeared on CBS’s 60 Minutes Mount Athos documentary, which aired December 2011.